Evaluating startup costs can be difficult for new retailers. You know that you need inventory to sell in the store, so it is a vital piece of information in your business plan. The problem is that it's very hard to know exactly what it will cost to purchase all of that inventory. Why? 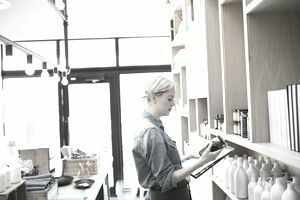 Just like many parts of your business plan, you may be required to have a retail business license before any vendor will talk to you about stocking their products. This can put a significant wrench in your plans because you can't go to the bank or even know if your business plan is viable without numbers, facts, and figures. Your idea is just that, an idea without facts on paper to back it up. Vendors and suppliers generally only send catalogs with dealer price lists to established businesses. A few may share this information if you explain to them you are planning a new business, but many will not. While this makes your job a little more difficult, it is still possible to get accurate estimates. This is where your new job as the company's accountant - get used to it, it's the norm for small business owners - will come into play. What product lines are you going to stock? How many items of each product line will you need to open the store? What is the MSRP of each of those products? You will also need to know that retail markup typically runs between 30 and 40 percent, depending on the industry segment. Luxury items and hand-crafted merchandise generally allow for higher markups. Basic and essential products may have a smaller profit margin. Let's say you plan to sell an item that generally retails for $19.95. Since you know the average markup, you can estimate that this product may cost between $14 and $15 wholesale. Multiply that by the number of those items that you plan to stock and you have the cost of the first product. Here's another example: You want to purchase a line of sweaters for your boutique clothing store from a great designer you found online. They do offer wholesale, but won't tell you what that cost will be without an account, which requires a license, address, etc. The sweaters regularly sell for $50. What will your estimated cost be for 20 sweaters? Continue doing this research and these estimates for each product you plan to sell. Don't forget to factor in shipping, handling and any other expenses related to obtaining the merchandise. Industry research, especially reports from trade associations, can offer some insight on what markup your retail segment uses. When you are actually ready to open the store and purchase inventory, you may get a better deal. By overestimating your costs, you will be sure to have the start-up capital needed. Don't worry about the extra cash, there are always expenses that you didn't account for that will come up as you open the store.